A few moons ago I played with Big Eagle at The Uptown in Oakland. They made quite an impression on me. They endeared me by covering one of my most favorite 'pop country' records by a female artist. It was 'I Don't Want To Play' by Ellen McIlwaine. A lesser known song, but I've got Ellen high on the 'to-do' list for a future post on this site. Big Eagle was simply awesome. Anyways, the first song that came to mind was 'Like A Children's Song' by Hugh Prestwood. Something I'd want to share with Big Eagle. Perfect tune for them to cover. Maybe if I'm lucky I'll get to see Bart and Robyn singing the sweet harmonies in this song. It's a sincere country romp that somehow fell into my clammy lil' hands. Hugh's got a rather strange tone to his voice, but it works beautifully in this song. The co-singer is uncredited but also amazing. The drums are ever present and snappy as hell and perhaps, that's what drew me in. It charges along much like the song says.. 'like cold water makin' the river sing'. In general the lyrics are heavenly. The song is a simple one, but of utter beauty and appeal. As far as I'm concerned this is the kind of genuine quality that makes country music so lovable to me. So clear is the heartbreak, the sorrow, the love, the faithfulness, and the sincere feeling in the tune. Hugh's been a man behind the curtain and done quite well selling a few tunes here and there. He's penned songs for Judy Collins, Crystal Gayle, and Randy Travis. I'm quite surprised this tune is so completely unknown and even more flabbergasted that Hugh Prestwood didn't become a household name. Perhaps he didn't want too... In fact, this song isn't even listed on his website. Maybe his vocal stylings weren't appealing to 'radio' audiences. Maybe it was just the record executives. Welp, they all missed out. I did track down a few other recent recordings by him. It seems he may have been so sincere and genuine in his music that he himself eluded any 'real' exposure. The lyrical context of his new stuff is so unconventional and un-pop that it's almost 'country underground'. At one point in one of his newer songs he declares 'I don't write these song to make a living' something my uncle laughed at when I played it for him. He said 'Well, that's pretty obvious..hehe...' Even a bluegrass lover like my uncle scoffed at it. Go figure. Sometimes real honesty in music takes people a back. But, if that's your thing, I suggest you seek him out. It may be just as hard to find his material today as it was then, back in 1972. I'm proud to say I'm a Prestwood fan. He has many of the elements I look for in this style of music. The flip, 'Louisiana Woman' is pretty good too. But, 'Children's..' is the bread winner here. 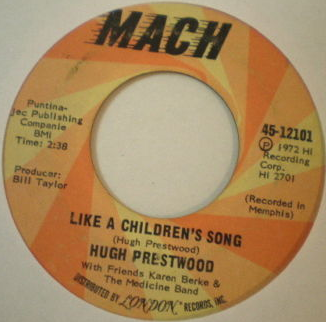 We love ya Hugh Prestwood.